Dungannon Swifts manager Rodney McAree is expecting a tough test when they host Ballymena United on Monday night (8pm). 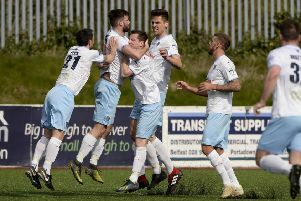 In a repeat of recent BetMcClean League Cup final, which the Swifts won 3-1 against the Sky Blues, McAree feels his side need to win and close the gap on David Jeffrey’s men. With a European play-off spot still up for grabs, McAree wants his players to finish the season strongly. “It’s nice to know that we won the last game, but I don’t overly think the cup final will have too much bearing. “It’s going to be a different game on a different pitch and it’s going to be another tough match for us. “I feel it’s a game we have to try and get three points from to get that bit closer to Ballymena, to give ourselves a chance of hanging in for that seventh spot. “I think there’s a bigger prize on offer at the end of the season, by finishing in seventh because you maybe will give yourselve an opportunity of getting into the play-offs for a European spot. “So to win a cup and quality for Europe would be a great season. McAree confirmed that defender Chris Hegarty (pictured) and Seanan Clucas are both struggling with injuries for this evening’s clash.